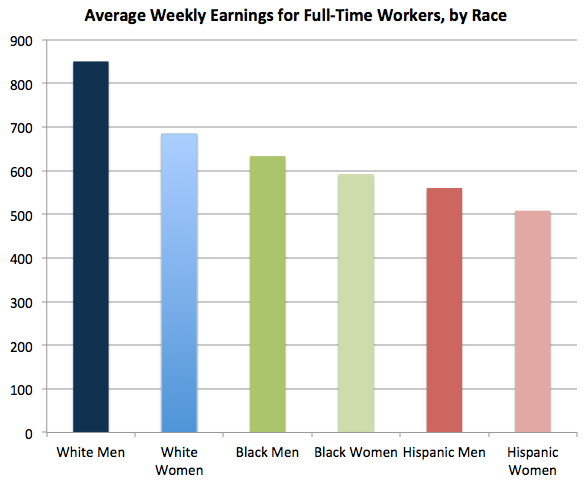 How much you make is tied to race and gender. According to findings posted last week in The Atlantic, labor statistics show that the US workforce is stratified by race and gender. This is no newsflash to women and people of color, but the statistics below should be at the center of Seattle’s living wage debate. Why the disparity shown in the graph? It’s partly a function of who works in what sector of the economy. Using data from the Bureau of Labor Statistics, the article shows that your race has a significant influence on the kind of job you have. Blacks, who make up 11% of the workforce, represent 33% of home health aides and 25% of security guards and drivers. Latinos, who account for 15% of the workforce, represent 44% of grounds maintenance workers and 43% maids and housecleaners. Asians account for only 5% of the workforce, but represent 60% of personal appearance workers (nail salons, hairdressers, etc). The bottom line: job sectors heavily represented by people of color and women pay lower wages. 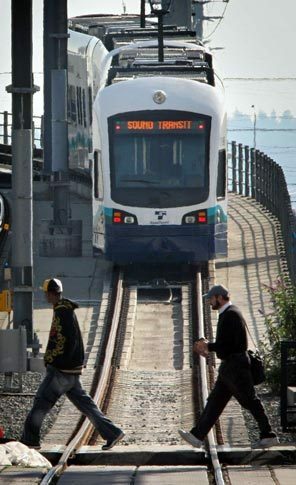 However, in SeaTac voters recently approved an industry specific living wage of $15 an hour and the measure itself shows a path forward to addressing inequity across industries. SeaTac’s Proposition 1 covers jobs that are disproportionately held by people of color: security guards, janitors, service workers, cabin cleaners and housecleaners at hotels. When implemented, the living wage will provide a $15 dollar wage floor, paid sick leave, and job security for over 6,000 workers in the City of SeaTac . Not only will workers in these industries earn living wages, but the measure will also boost local economic activity, bring more business to local (many people of color-owned) businesses, and create more jobs in the region. Living wage requirements don’t just help tackle income inequality, they are a powerful tool to address race and gender pay gaps. Categories: Living Wage Jobs, Port Jobs, Racial Justice, SeaTac Proposition 1 | Permalink. Just last week the final tally came in on SeaTac’s proposition 1. The “ayes” have it. So the sky must be falling, right? 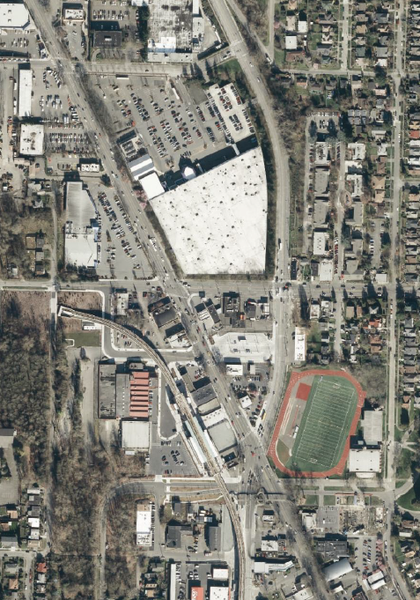 Afterall, opponents of the biggest campaign the City of SeaTac has ever seen have been claiming for months that businesses would close shop, employees would lose their jobs, and airlines would move their business away from SeaTac. Wrong. Despite these claims, business appears to be booming at SeaTac airport. Rather than moving business away from SeaTac, some are making new investments. 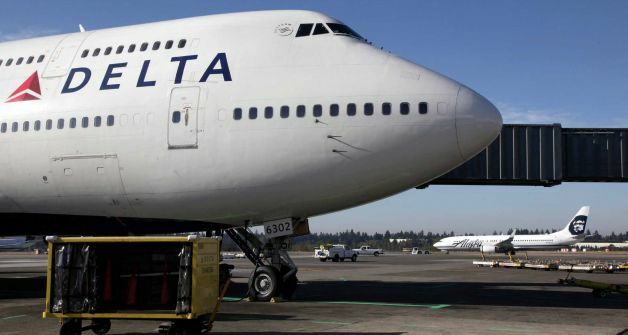 In fact, Delta Airlines is making moves to expand business at SeaTac airport. On election day, with a pending victory for living wages at SeaTac Airport, Delta Airlines announced, their plans to expand the Seattle market by adding 8 new daily non-stop flights, and a summer seasonal flight to Alaska. Demonstrating that with living wages, SeaTac Airport will grow as an international hub. Are we seeing businesses close inside the airport? Well, it looks like the opposite is happening for concessionaires inside the airport. Just last week, the Port of Seattle announced that they are opening 4 new duty free stores, which plan to hire roughly 85 new employees. Currently, Proposition 1 will cover roughly 6300 workers, but it looks like with these new shops and expanded flights, there will be even more living wage jobs at SeaTac Airport. Categories: Living Wage Jobs, Port Jobs, SeaTac Proposition 1 | Permalink.